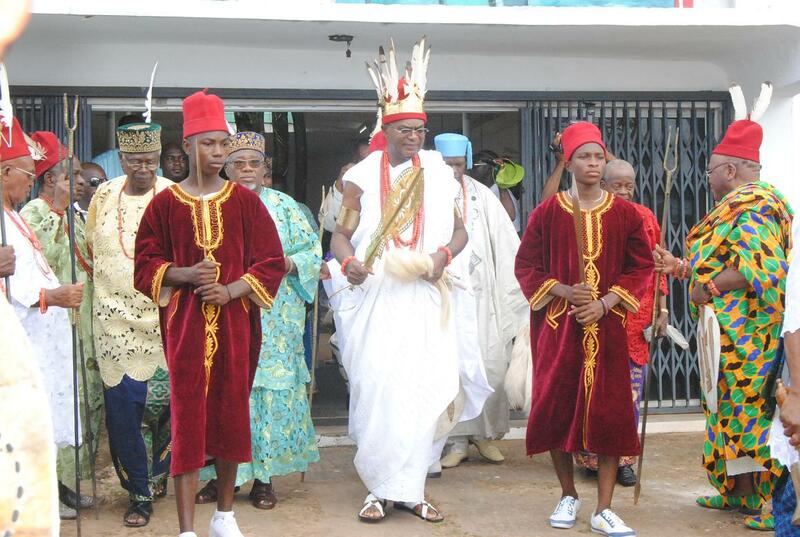 Obi of Onitsha, His Majesty, Igwe Alfred Nnaemeka Achebe (Agbogidi) celebrates his 16th Ofala festival. OFALA is celebrated in most kingdoms in Anambra State as a memorial ceremony for the remembrance of the date the traditional ruler of the area was installed. Indigenes of the various communities always look forward to their Ofala which takes place annually, usually towards the end of the year. There are two types of Ofala in the history of every monarch in Anambra. One is the annual event that attracts friends and well wishers of the people of the community during which the traditional ruler takes stock of his activities within the year and the other is the last Ofala which takes place after the death of the monarch. Activities in celebration of the Obi of Onitsha, His Majesty, Igwe Alfred Nnaemeka Achebe (Agbogidi) 16th Ofala festival, sponsored by Globacom, began, on the 10th of October, with the Oraeze International Arts Exhibition at the Ime Obi, Onitsha, Anambra State. Globacom in a statement issued in Lagos, said this year’s celebration of the festival would run through to Monday, October 16. The programme of activities shows that a youth carnival was held on Thursday the 12th, while the main Ofala will be celebrated in the morning of Friday, October 13, and a cocktail party, Eze Onicha, in the evening of the same day. According to the programme of event, Azu Ofala, will take place on Saturday, October 14, while the Ofala Music Concert, during which the most beautiful girl in Onitsha will be crowned Miss Ofala 2017, will be held on Sunday, October 15, at CJ Patterson International Auditorium, Onitsha. A royal banquet in honour of the Agbogidi, Obi of Onitsha, Igwe Alfred Nnaemeka Achebe, will hold at the Dolly Hills Hotel, Onitsha, on Monday, October 16 to round off the festival. Globacom expressed satisfaction that “the festival is growing bigger and bigger every year since we officially took over its sponsorship in 2011. We commend the Agbogidi for all the innovations he has over the years introduced to the festival to make it more exciting and a tourist attraction. We are delighted to be part of this noble festival for another three years.” The company charged all lovers of tradition and culture to visit the Ime Obi, Onitsha Palace, to experience firsthand the celebration one of the biggest festival in the south east and enjoy the hospitality of Onitsha people. Would love to visit this festival! Looks amazing and so vibrant with dancing!